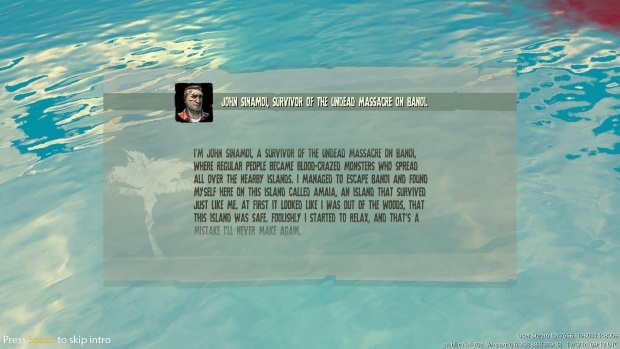 We are once again treated to John Sinamoi, the Australian character who aides the survivors during the events of Dead Island. 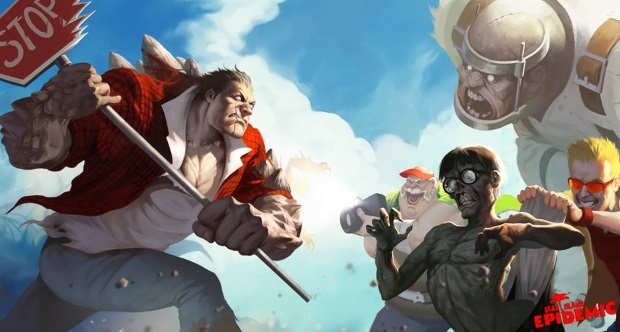 Dead Island: Epidemic is a far cry from the other games (Dead Island and Riptide). 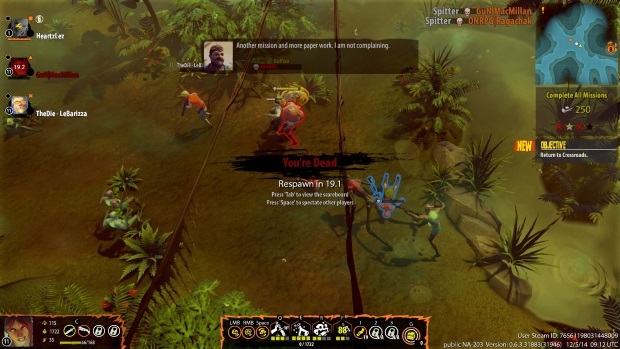 Instead of an FPS survival horror game, we now have an isometric third person survival MOBA. It is similar to many MOBA titles in that it is free to play, which will be both a benefit and detractor. Currently in open beta, there is nothing to stop players from disconnecting, or never connecting, leaving teams very underpowered versus other PC squads. That is one of the biggest issues I have seen in the Open Beta, and it is setting a bad precedent for people who are trying to improve the game through testing or learn the game mechanics. The survivors of this game have already been infected, but have somehow not been turned into mindless flesh-consuming monsters. Instead they are faster, smarter, and plow through the hordes of infected. These somehow-superhuman characters are introduced with far greater power than regular human NPCs. 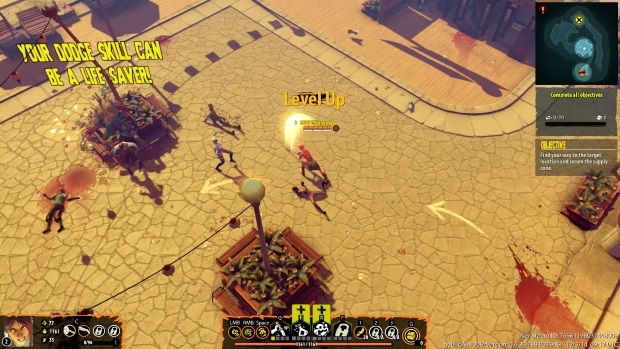 Epidemic offers a different take on the MOBA as there are three teams instead of the usual two competing over killing zombies and grabbing chokepoints to get the most supplies. The reintroduction of the special types of infected from the last two games is also a nice touch. The microtransactions and the time it can take to acquire new weapon plans and different characters can be a little vexing, but bear in mind this is an Open Beta where everything is still in constant flux. The main area of the game is your “crib,” a little hut that houses your workshop, characters, and other important features. It is from here you select what kind of game you want to play (PVE, PVP), as well as where you can craft or purchase new items. The characters themselves may prove a little confusing, with a system similar to DC’s Infinite Crisis. There are four primary characters new to the franchise: Amber (Support), Berg (Tank), Bryce (Ranged Damage/Crowd Control), and Isys (Bruiser). Each has their own skillset and stats. 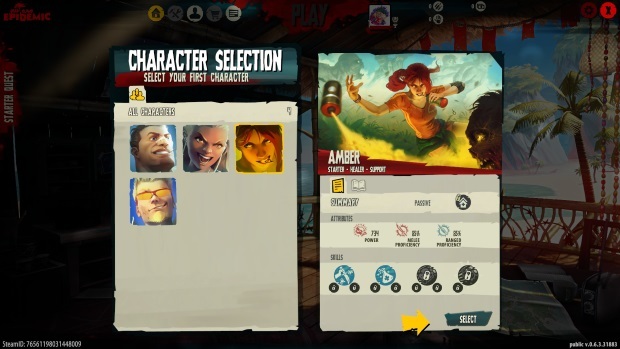 There are other characters that have been added and will continue to be added, such as Sam B., one of Dead Island’s main characters. Confusion comes into play as each character has multiple types: Survivor (standard version), Armored (tankier, scavenged armor strapped to them), and Mutated (more infected than normal, but come with more/stronger powers and abilities). You might think that if you started with Amber (for example), you’d have easier access to her Armored and Mutated forms. However, that assumption would be wrong as the other forms are just as expensive as any new character. When you start the game you can only pick from one of the Survivor types as your first character, but you are unable to try them out before you make your choice. I would recommend doing a little homework online to make sure you make the right choice, because unlocking new characters with “character points” can take a bit of time. 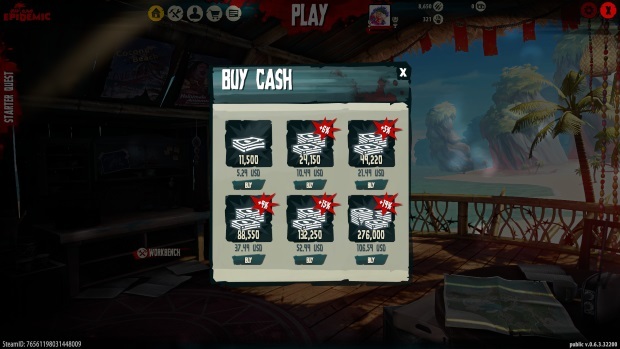 You can purchase character points with “cash,” but cash is purchased with Real Money™. This is quite the convoluted system, and can very likely cause confusion with players potentially new to free MOBA type gameplay. The microtransactions are more than a little silly. Friends, Romans, Countrymen: Lend me your Fists! Or ears, or swords, or guns. Speaking of micro-transactions, you can also purchase weapons from the cash shop. Your average weapon will cost you about six to ten bucks in real money, which is more than most people want to spend on a free game. There is another currency, “gear points,” which you accrue from playing matches (or again, real money is always an option). You can use this to purchase blueprints to craft new weapons, consumables, or gadget patterns. I genuinely feel like this title is trying to push real money purchases hard, with the ability to spend money on all the different currencies. You can also buy the DLC packs under “Services,” which seems to be a cheaper way to get characters. There are several weapon types, though. Guns make a return (and you actually can use them right from the start, unlike the original Dead Island! ), in addition to bladed weapons, blunt weapons, and fist weapons. The characters are able to use both ranged and melee weapons, and using the C key lets them swap between them at will. As stated earlier, not all of these weapons are fantastic. I have come across a few that are subpar at best. Attacks use the left mouse for standard attack and right mouse for a “rage” attack when a bar under your health bar reaches a certain point. Movement uses WASD and you cannot rotate or change the screen’s vision. QERF are your ability buttons, and each level you gain in-game lets you upgrade one of these, similar to many other MOBAs. Dead Island: Epidemic suffers from the same unfortunate weaknesses as the rest of the series has so far: it is a cool (but cliché’) idea with weak gameplay. It’s fun and interesting, with clever references to lots of other zombie titles. But it does very little to stand out from the other MOBAs on the market other than adding zombies and three team PVP. I definitely feel like this game is going to need a lot more to make its mark on the online multiplayer market than what I’m seeing here. Definitely fun, definitely going to attract fans of zombie-killing, blood-spilling action though! But I feel like it still has a way to go. While I most certainly enjoy the Gauntlet Legends feel, I do not enjoy the bombardment of microtransactions. 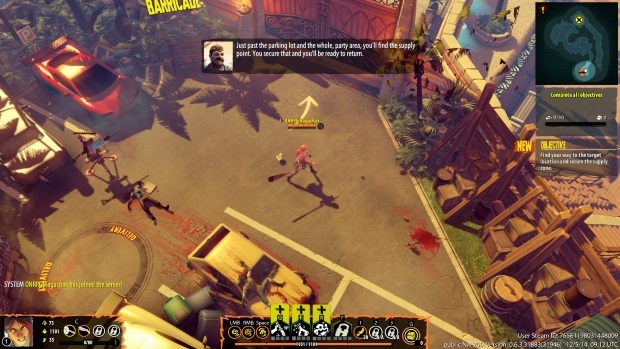 I do not feel Dead Island: Epidemic will be pay-to-win, but I wholeheartedly feel it is pay-to-go-faster. A little more work and I think this game can be a contender. The graphics are fairly cartoony, which is different from other Dead Island games, but still look quite nice. I do not see a lot of variation in the game maps which I would like, but I understand why this may not happen in a MOBA. Controls personally feel a bit awkward, with the W key being right between two of your abilities. Different from other games, and that’s not always a good thing as these controls are a bit odd to grow accustomed to. I was hoping for mouse clicking for movement instead of relegating it to combat. Despite the strangeness, the controls are very tight and easy to use. There are only two Game Modes and the starter missions (which are admittedly a nice way to get used to how the game plays), and right now most games seem to have at least one player quitting if things aren’t going their way. There is no punishment for this, which makes gameplay very frustrating. Most of my games had at least one no-show or quitter. I am certainly hoping more game modes/mission types appear in this game. It could use them. 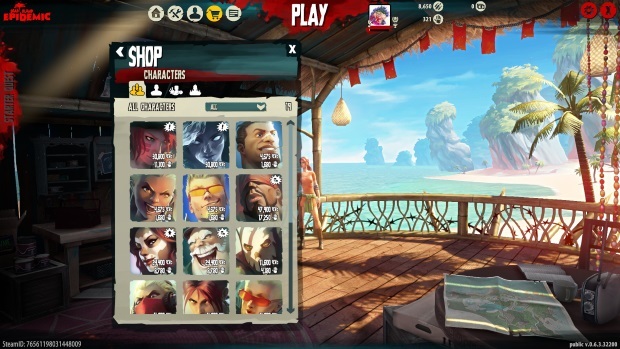 While most MOBAs do not have a ton of game modes, it would be nice to find other ways to acquire survivors, or a campaign mode; that would fit this type of game more than it would something like League of Legends. Sure, the groans and grunts of zombies as well as their violent deaths are pretty fantastic to hear, but the music is mediocre at best. The sounds of the game are terrific though. Gun fire, bat thwacks, and blade slices through infected flesh are all spot on, though watered down a bit by less than inspired music.